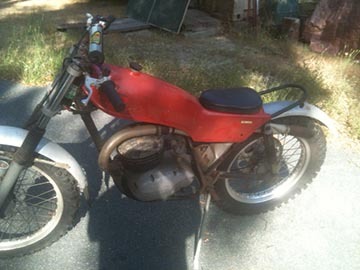 1970 Montesa Cota … talk about a project! It’s a story of brotherly love. 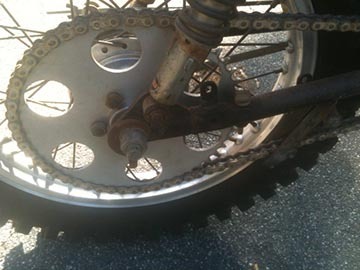 Gary Reed’s brother owned this bike ad had it stored at their dad’s house. He offered to sell it to Gary for $25, and Gary of course said yes. Little did he know that Dad was tired of it being in his way and had told the brother to get rid of it, but now it was Gary’s and HE had to do something about it. So he stored it in the back of his garage, uncovered, for at least 25 years. When he decided to move recently, he had to do something with it, so now I have it. It’s not at the museum — too rough. We’ll keep you apprised. I swept off the spiders. 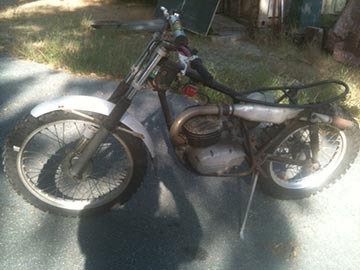 This entry was posted in Motorcycle Museum, Motorcycle Museum: The Latest Updates on 9 May 2015 by oldgeezer.